Sonam Kapoor Ahuja and her husband Anand Ahuja latest Instagram picture will make you go 'aww'. One of Bollywood’s most adorable couple Sonam Kapoor Ahuja and Anand Ahuja have been giving some major couple goals ever since they tied the knot. They never shy away from PDAs and keeps posting adorable pictures together on social media. 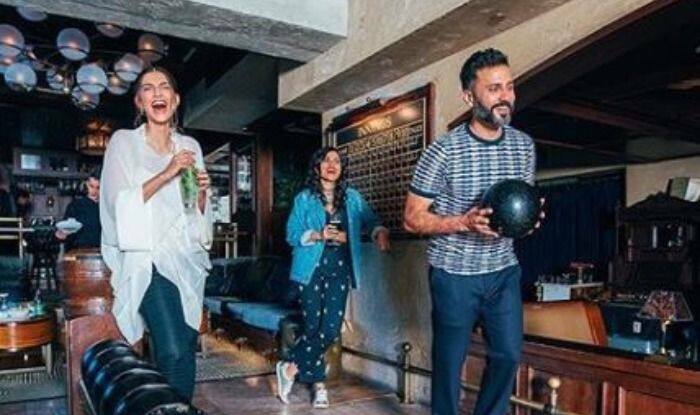 Recently, Sonam shared a photo bowling in Los Angeles. While husband Anand was busy enjoying his bowling, Sonam laughed away to glory. We wonder why. They are not just adorable but also the goofiest couple in Bollywood. Their Instagram is flooded with quirky pictures and videos. Sharing the picture on her Instagram, she captioned it, “A bar with a bowling alley? Say no more  Loved the cool vibe of the @spareroomhwood at @thehollywoodroosevelt, in Los Angeles  Tap the link in bio for more of LA! “. On the professional front, Sonam is all set to make her digital debut with a web series where she will unravel some of her style secrets. Sonam was last seen in Ek Ladki Ko Dekha Toh Aisa Laga and will next be seen in The Zoya Factor with Dulquer Salmaan which is based on a famous novel by Anuja Chauhan. Directed by Abhishek Sharma, the film is slated to release on June 14, 2019.